To better educate the general public about its plans to use roundabout intersection designs for upcoming highway projects, the North Carolina Department of Transportation used an informational video developed by engineering firm Stewart compiled in part with aerial footage captured via drones to visually explain to motorists, bicyclists, and pedestrians how to safely navigate them. “People are increasingly relying on digital video for news, information, and public discussion. 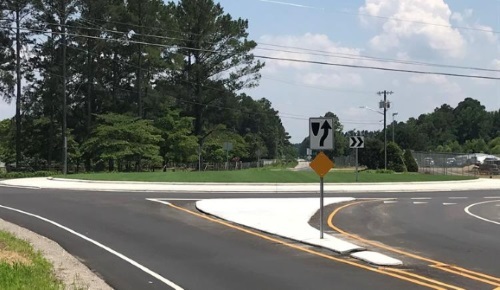 Videos, such as this roundabout informational video, are effective in engaging and educating,” explained Jamille Robbins, NCDOT’s public involvement and community studies group leader, in a statement. The agency noted that roundabouts reduce the types of crashes where people are seriously hurt or killed by up to 82 percent when compared to traditional intersections, while reducing intersection design/build costs and improving traffic flow. Yet despite such benefits, there is still “significant hesitation” among the general public largely as many remain unsure how to safely traverse roundabouts, noted Doug Taylor, Stewart’s vice president and transportation practice leader. Taylor explained to the AASHTO Journal in a phone interview that Stewart’s geomatics group used a drone to provide an aerial overview of motorists and others traversing an existing roundabout in western North Carolina, then actually drove through the roundabout using bicycle equipped with a video camera to provide a “ground level view” of proper roundabout navigation. That “driver’s eye view” combined with the “bird’s eye view” of the roundabout provided by the drone proved to be critical in securing public support for proposed I-77 intersection design, he stressed. He added that Stewart hopes to use such videos more often in the future. “This is the first one we’ve done but looking for opportunities to create some for other projects we’re working on, such as an upcoming synchronized street project we’ve got,” Taylor said. “This is one of things I point to as an ‘innovation’ in terms of how we reach out to the public – and it’s why we put it [the roundabout video] on YouTube,” he emphasized.